SARASOTA COUNTY, Fla. -- A search is underway across three states for a missing 9-week-old baby boy. The child's parents are both in custody. According to the Sarasota County Sheriff's Office, Chance Walsh's family contacted law enforcement Sunday to report the baby boy hadn't been seen since September 9. 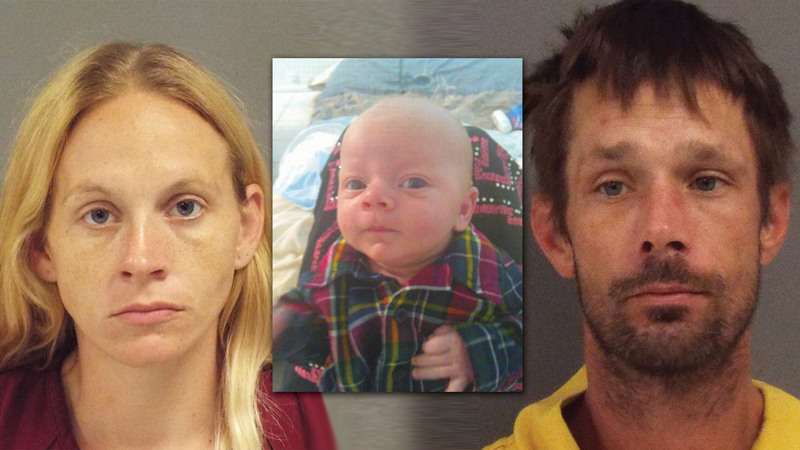 The family members told deputies the baby's parents, Kristen Bury and Joseph Walsh, are longtime drug users. Florida police began searching for the couple and discovered they'd called 911 in South Carolina, claiming they'd been in a car crash. When asked about the child, the couple gave differing accounts of the child's condition, including that the child was unharmed, that he died in the crash and that they gave him to a woman at a hotel in Georgia. Detectives later confirmed that there was no baby in the vehicle at the time of the crash and no room for a car seat. They also tracked down a woman at the hotel in Georgia who said the couple tried to sell her baby clothes, but the couple did not have a child with them. Deputies then went to the couple's home in Florida where they found blood on bed pillows, comforters and a mattress, ABC affiliate WFTS-TV reports. Blood was also found high on the walls, door, mirror and light fixture in the bathroom. Early forensics indicated a possible presence of human remains, but the child was not found. Police are working with the FBI and the National Center for Missing and Exploited Children to locate the missing 9-week-old boy. Walsh and Bury are now being held on charges of child neglect. Charges against the parents could be upgraded once the baby boy is located.